Back in 2007 when I wrote my first blog post, I hadn’t expected that starting a crafty blog would lead to becoming an “influencer” – or having to consider my own ethical response to that new title. As good marketers, companies smartly like to partner with influencers – send them regular boxes of product, sponsor their posts, give them freebies to pass out to promote their company. Increasingly over the past 3 or 4 years, I’ve been receiving more of those offers – but I am a rare bird that closely limits those relationships…I’ve been told there aren’t many of me out there. However periodically I have received product releases from two companies who I work very closely with, and once in a rare while from others for special occasions or bloghops. But I turn down lots of those offers each month. Why? While I know I could get a lot of free product, I’d truly rather buy it myself; that way if I tell you something is the best stamp set ever, it is because I really did think it’s the best and bought it. My goal here is not to get you to also buy it, though; I do make a portion of my income because some of you kindly use my compensated affiliate links – but I’m just as happy if you use my techniques on stamps you already own. I love encouraging people to create! All that said – I’m excited to let you know that MFT is entering that tiny band of companies I’ll be working more closely with. I’ve been an MFT fan and customer for ages, and partnered with them way back in the OWH days when they were very generous to the organization. I’ll be receiving their new releases to use for the monthly compensated videos on their channel, and you’ll continue to see coloring videos with their stamps on my channel as normal, too. I hope you’ll be enjoying them all! Ironically, while working on this post, I saw an article in The Washington Post by Sarah Halzack, Influencers Lives Look Perfect, which explains a bit about how influencers work. And made me realize being a lifestyle blogger is a lot more lucrative than art. Ha! A bonus for YOU: Since I’ll be receiving additional product, I’ll have more to eventually mail out during Customer Appreciation Week! What’s that? Instead of selling my excess or doing giveaways like lots of bloggers do, I like to totally surprise people. So about every 6-8 weeks, I lighten my stash and choose random customers to mail out cards and/or surprise packets of gently-used products that I won’t get around to using again. No notice, I just surprise their mailbox! Hooray for being able to share more MFT with you in those mailings! 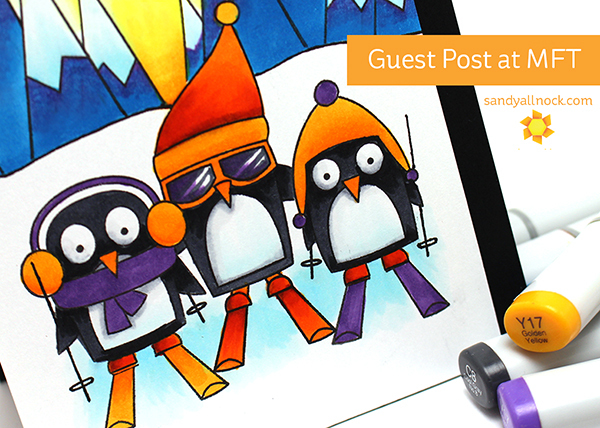 And now…go say hello over at MFT! Watch Copic Coloring: Chill Wishes on YouTube or on the blog post I wrote for them. Leave some love over there! And be sure to head over to YouTube to subscribe to their channel so you don’t miss out on my videos there…I’ll post here on my blog when the monthly post goes live, but I won’t be notifying you each month on YouTube. Click to pop over to MFT! As always, your video is very informative and encouraging. AND the coloring is beautiful. I first heard of MFT back I the OWH days…and fell in love with their product. Happy to hear you’ll be teaming up with them! Love MFT products! This card is super cute! Absolutely love the penguins. I love MFT stuff! And, they are within driving distance for me. Soooo…if you ever decide to come and teach at MFT, I’ll be there! Hint, hint, hint! I do so admire a person brave enough and ethical enough who, knowing the influence they have on some of their followers, uses that influence positively. A while ago you mentioned not doing haul videos because of what they portray to those who cannot purchase. I applauded that action. Through this blog I have found you to be a person I will definitely follow for a long time not only for your talents but also because of your wonderful spirit. MFT is lucky to have you on their team. Sandy, I love that you only promote what you believe in! We know your opion is honest and I have been nothing but happy with any product or company you work with. I too love MFT products and began using them during OWH card making days. Thank you for promoting such great products and companies. I haven’t been into crafting long but you’ve inspired me in so many ways. It is too bad that I found you after I’ve already purchased the whole collection of spectrum noir markers but your tips are still very helpful. Brand doesn’t really matter. They work the same. I’ve learn alot from your blog and videos. I am getting into watercoloring and love your tips. Thanks for introducing art impression watercolor stamp to us. I bought several mini watercolor sets as you suggested and love it. Congrats on your new journey with MFT. Love them as well. Hooray! Excited for you and MFT! Talk about a win, win…. and win for us, too! I love MFT products and I’m a huge fan of your blog. You + MFT = a match made in heaven! Thanks for sharing your thoughts and I’m glad you don’t accept offers from all–as you DO influence us in what we choose to purchase. I appreciate your integrity, your sharing of your faith (which I also share) and you got me started with Bible journaling–which I need to do more of–but it seems a certain verse sticks in my head, becomes “my verse” for a week or more and then I journal it and it sticks to my heart. Thanks for that! Congrats, great opportunity! Love your Hex Chart by the way, makes choosing Copic Colors so much easier and friendlier for my wallet! really like mft products. They are a great company. A fun card! MFT has wonderful products! Just seen the post on MFT’s blog. Great work! I follow you both with a lot of pleasure!!! Saw this on the MFT blog. Should be a great month! I really like MFTs products and look forward to seeing your posts on their channel. Thank you for sharing these thoughts, some of your back story and your love for MFT. Being a newbie of only 6 months to this crafty world Ive been an advid follower from day one of you. My mother, who had been doing this for almost 8 years, immediately brought you to my attention when I struggled understanding copics. She loves your classes and uses alot of your techniques in her own lessons. That being said, MFT also become one of my very first stamp companies I fell in love with. Im so excited to see my two favorites in a marriage. TY for your videos and tips and to MFT. That’s great news! Congrats! Love your work, and love MFT! Hi Sandy, I have followed you since the OWH days and I must say that the positive side of being an “influencer” is that it also means you are an INSPIRE-ER, ( don’t know if thats a word?). I AM HAPPY FOR YOU TO BE PAID FOR YOUR WORK. Sharing your talents and creativity has value to all who enjoy and learn from your experience, skill and love of art. I appreciate your ethical approach to choosing business relationships wisely, but I would never question your integrity. Your ethics and morality always shine through your work. Thank you for being a positive influencer in the blog world! Love your videos Sandy. What a great team you’ll make with MFT. I love their products and can’t wait to see what you create! 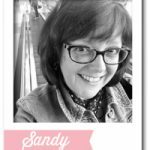 I’m both a Sandy fan and an MFT fan, so I am thrilled to learn of this special partnership! Cool penguins. I like you being an influencer because you have influenced and inspired me to go out of my comfort zone, My cards are much better because if you. Thank you. Love your videos as I just got into copies! It just stinks that they are so hard to find though! As an unemployed woman with a daughter in college I could really use some gifties! MFT is one of my favorite companies from back in the “Who’s that girl?” days. I’m so excited that we’ll see more of you using their products!